The peopling of North America debate has continued to be a topic of global interest. Theories include single and multiple migrations, coastal and inland routes, and slow and rapid dispersal with the populations originating in Siberia and Europe (cf. Dillehay 1999; Dixon 2002; Fiedel 2000; Stanford and Bradley 2000). Archaeological evidence, as well as linguistic, dental, and genetic data has been invoked in support of these theories (cf. Goddard and Campbell 1994; Schurr 2002, 2000; Turner 1994). In the midst of this plethora of theories, the Bering Land Bridge model of early entry into America must not be dismissed. Strong evidence supports the case that some people migrated from Siberia to Alaska via the Bering Strait. This remains one of the simplest theories and is supported by archaeological, linguistic, genetic and dental evidence. Until recently, the life way of ancient Alaskan cultures has been largely a matter of conjecture, based upon vegetative reconstructions and the limited paleontological record, dating largely from full-glacial times. Subsistence is assumed to have been based on big game, i.e., remnant Pleistocene megafauna. Discovery of the Broken Mammoth, Mead, and Swan Point sites near Shaw Creek in the middle Tanana Valley (Holmes 1990, 1991, 1996, 1998, 2001; Holmes and Yesner 1992; Holmes et al. 1996; Yesner et al. 1992; Crass and Holmes 2003, 2004) and the renewed investigation of the Gerstle River site (Potter and Holmes 2000; Potter 2002) have provided new data to evaluate this hypothesis. These Tanana Valley sites represent “overlook” sites from which game could be spotted and a variety of microenvironments exploited. They were preserved because of proximity to streams that supply aeolian (loess) sediments that buried the occupations within paleosols (Thorson 1990; Dilley 1998). 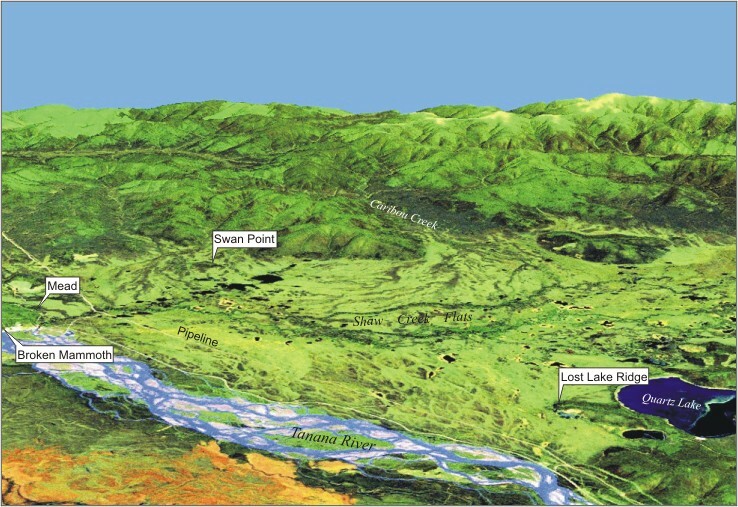 It is significant that Swan Point is not only the oldest site (radiocarbon dated between circa 15,000 and 14,200 cal. BP), but also contains microblade technology throughout the multiple components. This makes the site comparable with the other Tanana Valley sites, yet distinctive- a position that may be advantageous for testing theories on site formation, group mobility, and landscape exploitation patterns. ""The Tanana Valley in cental Alaska was clearly at the eastern extent of a vast, mostly ice-free landmass that extended from Siberia at the end of the Pleistocene," Holmes declares. 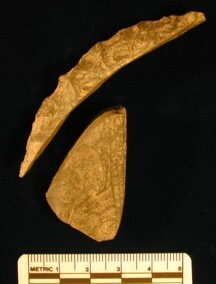 "My interpretation of the early Swan Point archaeological evidence is that at this early period, the human demographic of Alaska was a derivative of Siberian peoples."